The ICOM IC-T70A/E is a ruggedly built dual band transceiver capable of putting out 5 watts. It comes packed with a long-life battery pack; over 10 hours on a single charge. An optional Li-Ion battery is available to push operation to over 13 hours. The IC-T70A/E has 302 alphanumeric memory channels, including 50 band edges and 2 call channels. With a maximum of 26 memory banks, you can pick and choose the desired banks for scanning from the 250 memories. to IP54 and is tested to and passed MIL-STD-810 environmental tests. 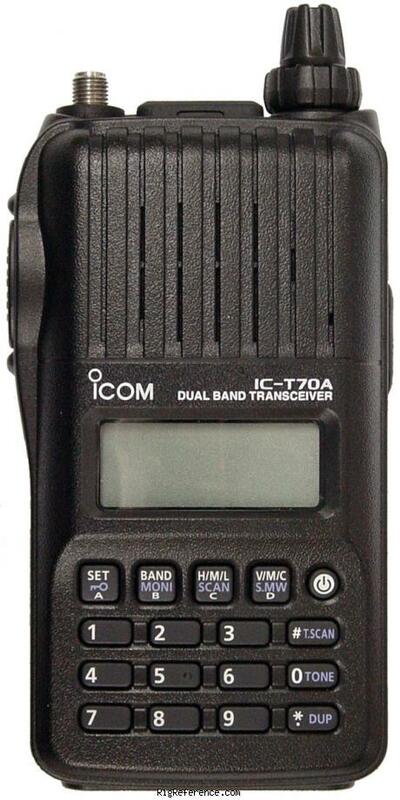 The IC-T70A is the U.S.A. version of the ICOM IC-T70E. Estimating the value of a rig can be challenging. We collect prices paid by real hams over the years to help you estimate the current value of the ICOM IC-T70A. Just bought or sold this model? Let us know what you traded it for and help other ham operators!